Teachers at Chatham Hall encourage students to think, question, ponder, and to use these skills to come to conclusions. Students do this out loud in class, at night as they prepare for classes the next day, at the lunch table, and while listening to visiting lecturers. 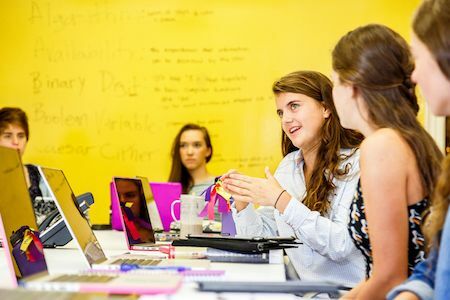 Thinking, wondering, and producing — skills that are highly esteemed and necessary in today's world — and skills that Chatham Hall students put to use all the time. Martha is from Massachusetts, where she was born, raised and has worked for most of her career. She received a B. A. in French as well as a Master of Arts in Teaching from the University of Massachusetts in Amherst. After studying and teaching for two years in France, she began her career in independent schools where she has taught many different disciplines and age groups, served as department head, academic dean and dean of students. Laura Daniel graduated from The College of William & Mary with a Bachelor's degree in Business/Psychology and a Master's degree in Counseling. She completed her Ph.D. in Counseling and Counselor Education from The University of North Carolina at Greensboro. Prior to serving as Academic Skills Teacher, she worked as a counselor and teacher at Danville Community College, primarily responsible for coordinating services for students with disabilities. Laura lives in Danville with her husband, Steve, and three daughters - Katherine, Audrey, and Rebecca . A life-inspiring education is the sum of powerful parts. At Chatham Hall, these strengths include our profound commitment to critical basics such as public speaking and exceptional writing. Our faculty members are passionately dedicated to creative methods of teaching. Walk in on a French lesson and you might find girls sampling a French delicacy in the classroom kitchen. We also focus on engaging with new technology. For instance, all math teachers use Smart Boards and our science labs boast state-of-the-art equipment. All of our students use iPads for studies, and our teachers are experts in harnessing these tools to strengthen and enhance the classroom experience. One of the ways in which girls learn best is through collaboration. At Chatham Hall, girls collaborate all of the time...in and out of class. Teachers and students design projects that enable close work with classmates as you make and edit films, design a KeyNote to introduce Roman numerals, use up-to-the-minute technology in the Lee Library to produce realistic interviews of historical figures, or plan a Chatham Hall community garden and renovate the school greenhouse. Students who share a similar passion might design an iQuest together. Performances come to the stage thanks to students’ creative forces; Iris, Chatham Hall’s literary magazine, and the Columns, our newspaper, come to fruition because students work closely, share ideas, edit, revise, and partner to achieve a goal. Why is collaboration so important? When you collaborate, you learn about the decision-making process and how to choose the best idea of all those generated. You discuss approaches, negotiate, and develop skills that will lead you to creating a top-quality product. The broad and deep curriculum one finds at Chatham Hall asks students to think, question, imagine, wonder. In order to satisfy student curiosity, iQuest and Discovery Challenge programs allow students to design projects that will have them finding answers to their own essential questions – in some cases, receiving significant funding to pursue a well-developed question. Internal motivation and creativity bring about the best type of learning – Chatham Hall supports this most dynamic exploration.